One of the central tenets of modern computer science is that it is a collaborative discipline. The importance of collaboration is emphasized in the new K-12 Computer Science Framework, and collaboration is increasingly emphasized in the computer science industry and by professional societies. Relatedly, curricular frameworks such as the Next-Generation Science Standards also emphasize collaboration and computational thinking as practices that students must engage in “across all grade bands.” Yet, many students reach high school and college without ever learning to collaborate well, particularly with diverse peers. 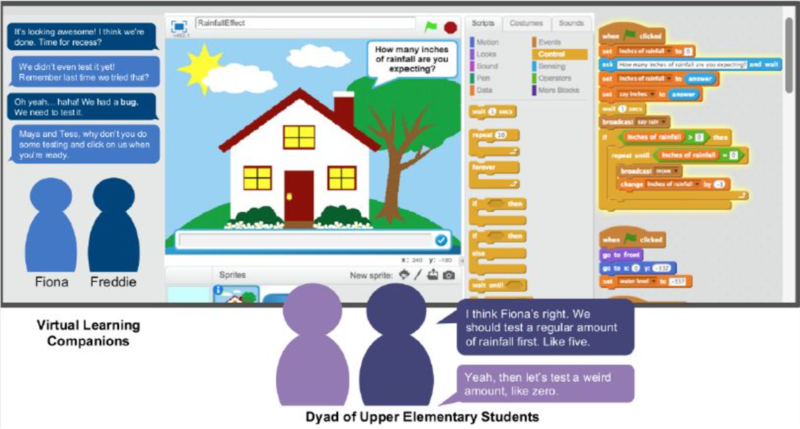 The FLECKS project will create a collaborative computer science learning environment for upper elementary school classrooms, addressing the pressing need for young students to develop fundamental computer science competencies and collaboration practices. This project is led by PI Kristy Boyer at the University of Florida, and PI Eric Wiebe and co-PI Collin Lynch at North Carolina State University. The FLECKS project will provide the potentially transformative opportunity for upper elementary students to learn computer science and build strong collaboration practices. Leveraging the great promise of virtual learning companions, we will address the following three thrusts. 1) We will collect datasets of collaborative learning for computer science in diverse upper elementary school classrooms. Our initial dataset will provide a ground-truth measure of students' collaboration approaches to classroom computer science learning tasks. 2) We will design, develop, and iteratively refine FLECKS' intelligent virtual learning companions, which support dyads of students in a scaffolded computer science learning environment with an interactive online coding tool. The technical innovation of FLECKS is the way in which student dyads are supported: each pair of children within the elementary school classroom will interact with a dyad of state-of-the-art intelligent virtual learning companions. These companions will enhance the classroom experience by adapting in real time to the students' patterns of collaboration and problem solving to provide tailored support specifically for that pair of students. 3) We will generate research findings and evidence about how children collaborate in computer science learning, and how best to support their collaboration with intelligent virtual learning companions.